Slackers is giving you a chance to win passes to an advance screening of the upcoming film Teenage Mutant Ninja Turtles Out of the Shadows! 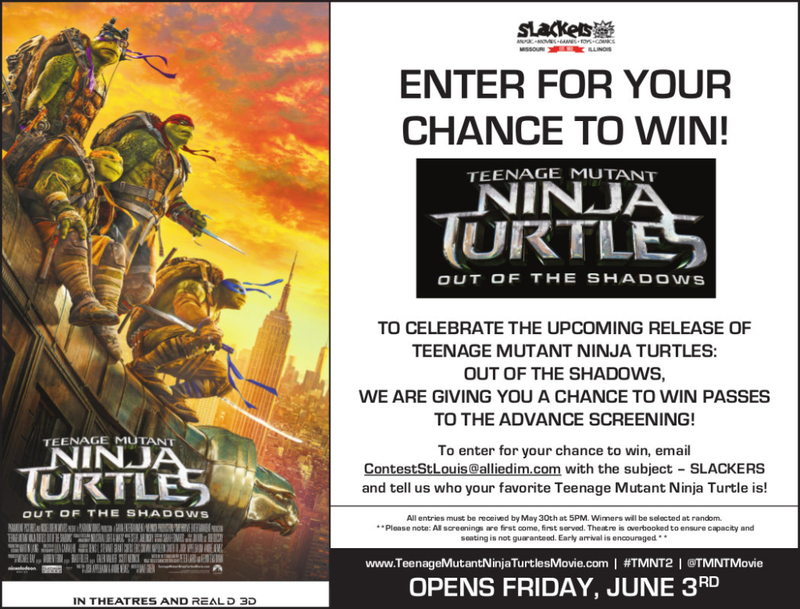 To enter, just email ContestStLouis@alliedim.com before 5PM on May 30th with the subject – SLACKERS and tell us who your favorite Teenage Mutant Ninja Turtle is! All entries must be received by May 30th 2016 at 5:00 PM. Winners will be selected at random. **Please note: All screenings are first come, first served. Theater is overbooked to ensure capacity, and seating is not guaranteed. Early arrival is encouraged.